I don't typically condone hoarding, but I will admit, I hoard magazines. I am obsessed with glossy reads and I have so many intentions of organizing them, creating inspiration books, reading them again and again.... and then I never do. Shame on me. 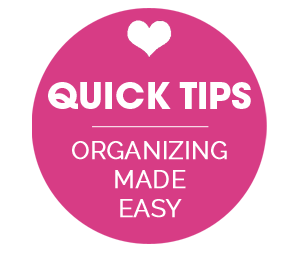 But organizing magazines is definitely on my list of to do's, and I am feeling even more inspired than ever to tackle that long awaited task, thanks to Ashli's tip that she is here to share today. Hi, it's me, Ashli from Mini Manor blog again. I am so excited to be sharing today's post with you. 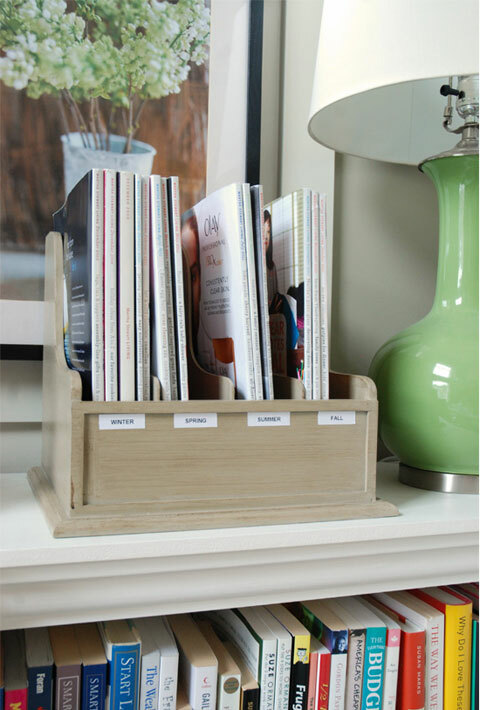 It's a simple solution to a common problem, what to do with magazines you want to hang on to. I don't keep every magazine that finds it's way into my house, but every now and then there's an issue that I can't seen to get rid of. I was getting a bit tired of a stack of magazines on the coffee table . . . especially when it's summer and there's a Christmas decor magazine on the top of the stack. 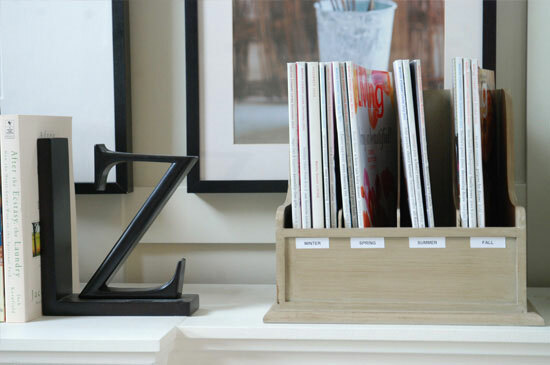 I found a wood organizer from Homegoods, I believe it was meant for file storage but it fits magazines perfectly. I organized them by season. 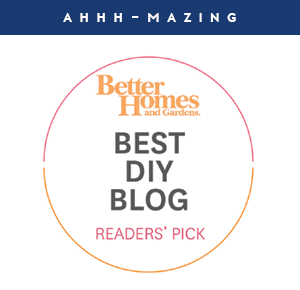 I group all of the spring issues together, all the fall, winter and summer seasons together, so when each season rolls around I just grab the issues in that season to find seasonal recipes, or decorating tips. I printed out some labels, and operation magazine organization is complete! 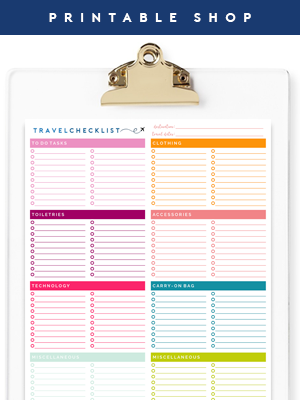 I love simple organizing solutions that work. I hope you do as well. 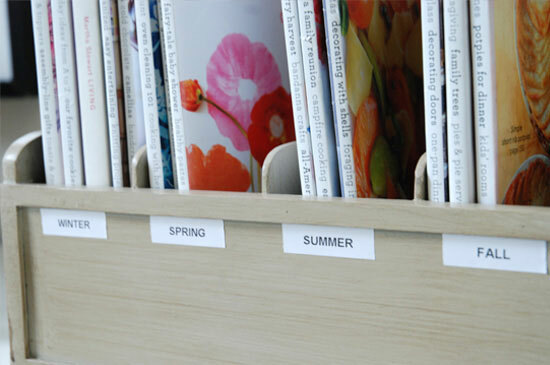 Storing magazines by season instead of a big stack makes it easier to find what you need when you need it. I store our magazines and all of our books in our library/office . . . 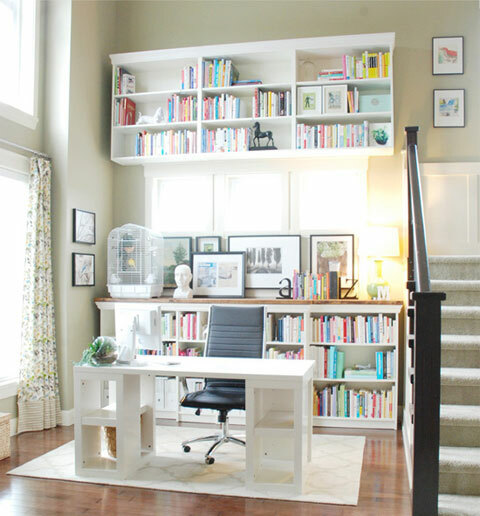 But if we had a dedicated family room I think this would look nice, and make sense there too. "I’m Ashli from Mini Manor Blog. I live in Big Beautiful British Columbia with my Husband Lee and our 5 lb yorkie Max. 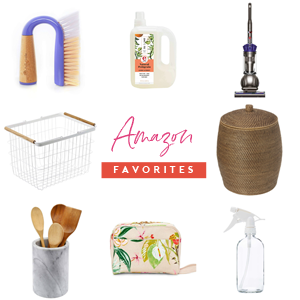 I have an organizers heart, I am a bin-aholic, and I’ve never met a wicker basket I didn’t love. During the summer I can be found lounging in the garden or at the gym . . . one of those was a lie. And in the last 5 years I’ve made more then 2000 cupcakes. I want to bake, eat and organize. Hand me some eggs, flour and an unorganized kitchen, that’s my idea of a great weekend, okay go ahead throw Ryan Gosling in there too." Great idea Ashli! I keep mine organized by category as well. I just use magazine files. But, I like the idea of having them all in one place. I think this would be great for our cooking magazines! I went the other direction with my magazines recently. Two that I get give me a free iPad version, and I started using Evernote. So now at the end of the month, I download the e-version or "print" to PDF recipes etc. from my other mags and save them to Evernote. Now all my mags fit in one little basket and I always have something fresh to read. I must confess I have something approaching 1,000 magazines on many topics. I keep mine separated by major type and then subtype. For example, all the jewelry making magazines are a section, but divided into beading, stringing, wirework, metal clay, polymer clay, glass fusing, etc. I flag the specific things I liked in each magazine with Post-it flags so I can find something fairly quickly. None of these were ongoing subscriptions, so each was bought specifically for something I really liked in the issue. Those standup magazine files are a must, but you can make them yourself out of cereal boxes or other cardboard covered with pretty wrapping paper. I find that having a library of things I love to look at is a big help in getting through those long, dark winters and other depressing times. Jen - Is your header supposed to say "Uheart" or was it a typo? Just making sure your aware, so if it needs corrected you can quickly. :) Much love! Nope! Not a typo. 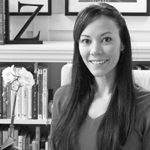 "U"Heart organizing is when my contributors stop by to share their tips and tricks. xo! This is genius...and means I might actually get some use out of the 82 magazines currently stacked in a pile for me to read. Ashli I love that you picked up the organizer at HomeGoods, I have one of those about 10 mins from me and love to shop around in there. Jen, since I have started reading your blog I have hoarded a lot more home/diy magazines. They are fun to cut and paste from to help visualize projects. :) Fun post. Thank you so much for the inspiration! I save a lot of my magazines too and I organize them by year but seeing yours organized by season makes more sense for me. Totally stealing that idea. And I love that container from Homegoods. There are so many good things at Homegoods. And I love your office...Such a cool place! I've seen that file box in Home Goods. But all my mags would never fit in just 1! I don't buy magazines, I live in New Zealand and for the same price as a magazine here I could buy a book back where I lived before. The library is brilliant though and has all the new magazines and back copies, so there is no need to buy them. Much more ecological and saves having to organise them. If magazines do come my way I read them and pass them on to friends. I like your idea of organizing issues by month or season so you can find what your looking for with out digging through a big pile of magazines. I'm so glad to read all the comments about hoarding magazines. I think my husband thinks I have a problem, but now I feel normal. Mine are all stashed in my nightstand cabinet with pages dog eared that I plan to tear out and organize...some day. I do the seasonal thing with my recipe collection, too. Made sense since I pick out recipes based on the weather, in-season veggies, etc. 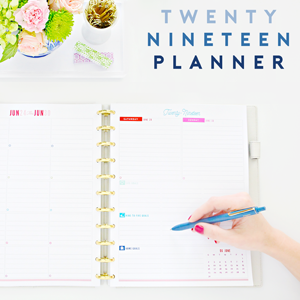 Cute, simple, and super-practical...now that's my kind of project! Thanks so much for sharing, Jen and Ashli! Have a great weekend! Thanks for sharing your fabulous ideas! I love the idea of organizing the keepers by season. So smart. That seriously never occurred to me. Thanks for sharing!